The defender returned to the Caledonian Stadium on a one-year deal last week after a summer of uncertainty. 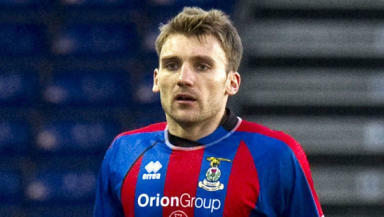 Chris Hogg says a return to play for Inverness Caledonian Thistle represented the best option for him and his family after a summer of uncertainty. The central defender moved back to the club on a one-year deal last week, having originally left the Caledonian Stadium at the end of the 2010/11 season to pursue options elsewhere. But after considering moves to England and abroad, Hogg accepted an offer to stay in the Scottish Premier League and says he is already impressed with the increase in quality within the squad in the period since his departure. “At the end of the day, from what was available, this was the best option for me to come back up here to play for the manager and play for the football club,” Hogg told STV after Inverness’ friendly at Lossiemouth on Tuesday night. “I took the summer to see which options were down there, there were options from abroad as well. I was talking to my wife and deciding what we wanted to do. “There's a different squad here from last year but it's a good squad. Players have come in from a good standard and they are of a good calibre. Hogg moved to Inverness from Hibernian at the end of January, at a time Terry Butcher’s team were chasing a top six finish following promotion the following season. A seventh placed finish was eventually achieved and Hogg says the club are aiming to improve and earn a spot in the top half of the table come the end of the season.